Tea at the Oscar Wilde Bar at the Hotel Café Royal. All photos courtesy of the Hotel Café Royal. We're turning our sights to London this week, starting with a hotel that has turned our heads of late. 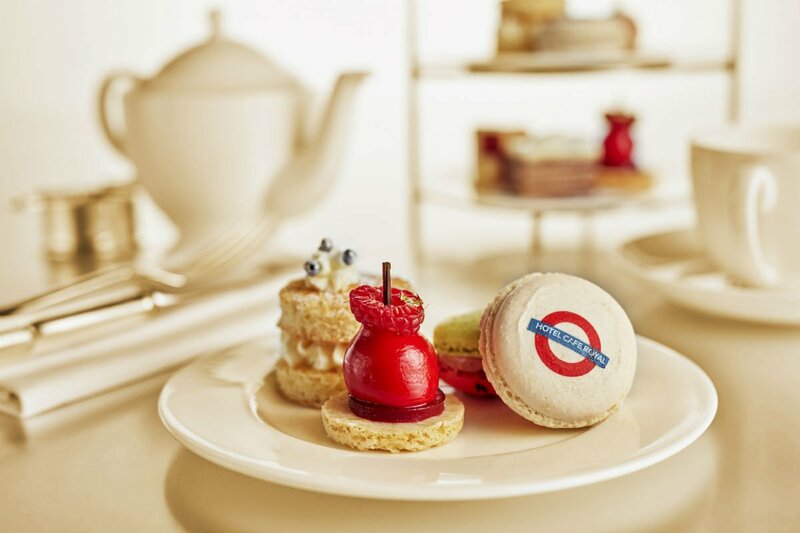 Local girl Liza Foreman stops for high tea and history at the Café Royal, an architectural gem in Picadilly. Situated on Regent Street, a stone's throw from Piccadilly in the heart of London, Café Royal stands in a league of its own. 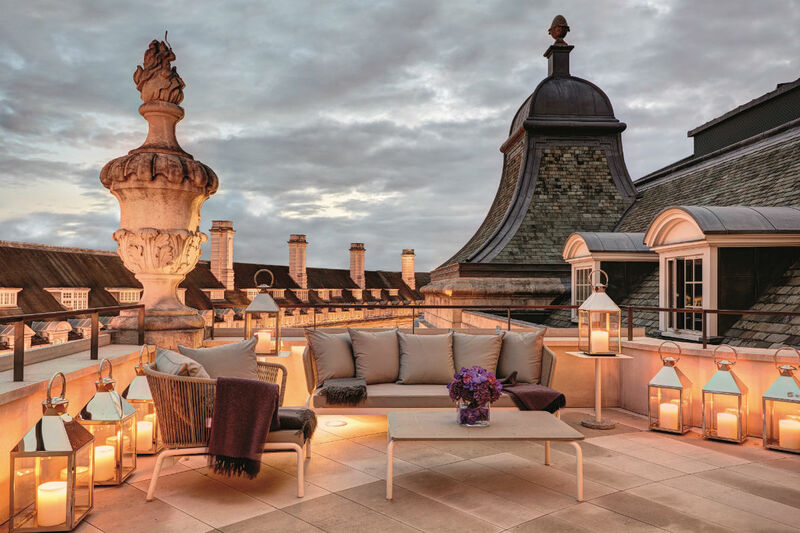 The recently reopened hotel has an illustrious and colorful history as one of the most renowned meeting places in London, frequented throughout the ages by everyone from Oscar Wilde to Lady Diana. It's more than just a hotel, with a buzzing year-old private Member's Club and the sublime subterranean Akasha Holistic Wellbeing Centre with meditation and yoga rooms and excellent spa treatments. Fully restored four years ago, Café Royal was part of a London Renaissance that gave rise to new luxury spots and trendy designer eateries. It is now one of the most special places to stay and meet in London. 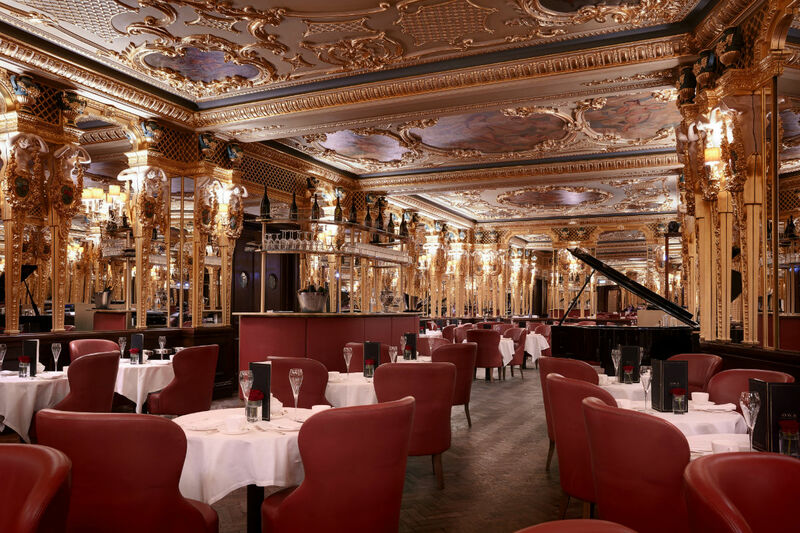 The bar at Café Royal's serves rich history along with a lovely Pimm's. 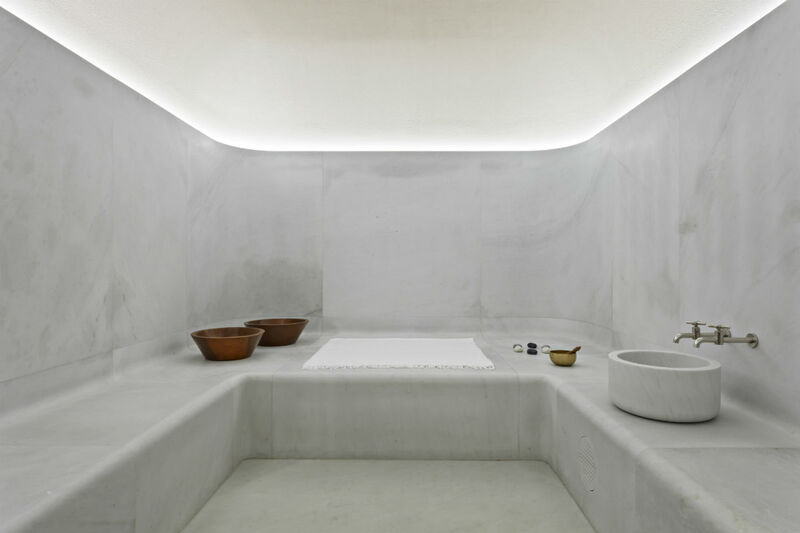 Turkish hammam luxury in the heart of London. Café Royal began life as a wine cellar and was once considered to have the finest wine collection in the world. By 1890, it had become the place to see and be seen in London: Oscar Wilde would meet his lover here when it was a restaurant and meeting place. The gilded Oscar Wilde Bar, established in 1865 and originally named for Louis XVI, now honors the author and wit. Originally the headquarters of a sporting club, it was closed between 2008 until 2012 for extensive renovations by new owners The Set, a hotel group known for converting a handful of beautiful old European buildings into new properties (like the wonderful Conservatorium in Amsterdam). The new and improved Hotel Café Royal. Extensive marble work is the warmest of welcomes. 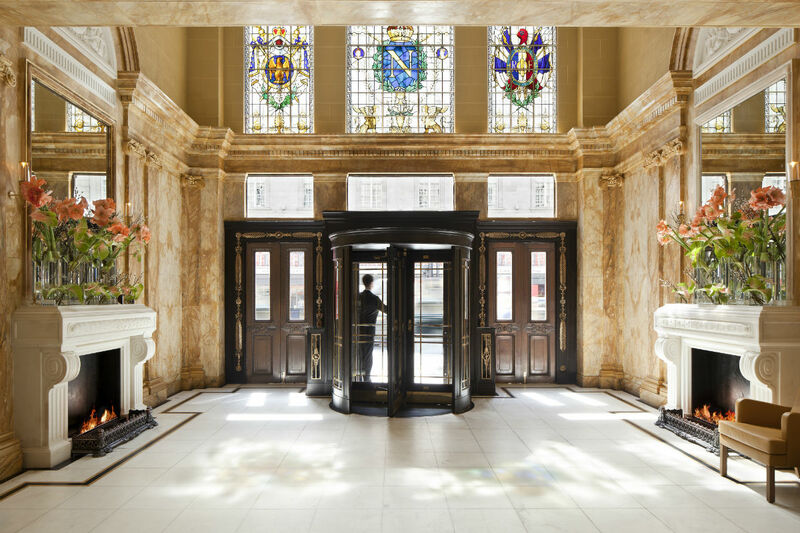 The lobby is beautiful and rich in history, with the original owner's initials still visible in the marble surrounding the revolving door. 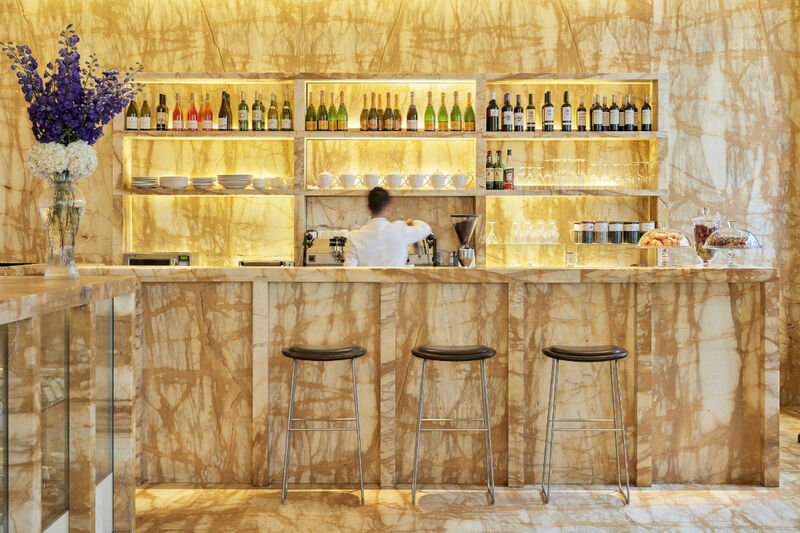 Oscar Wilde Bar, with its stunning golden ceilings, is one of the most opulent salons in London. The luxurious spa and wellness area, with its eighteen-meter pool, hot tub, and soothing rare stone and light display, is where I spent my spare time drinking tea, swimming, and chatting with guests. It also offers the best shiatsu massage I've had this side of Tokyo. 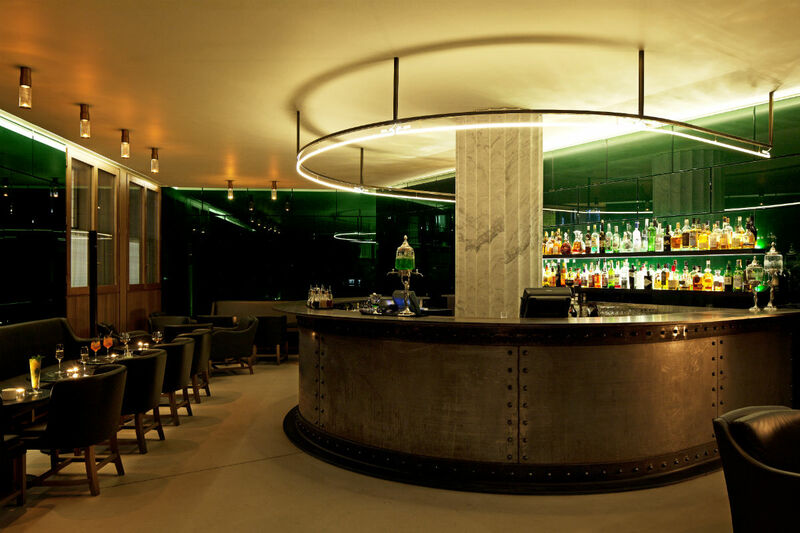 There are several noted restaurants on site, including Green Room designer absinthe bar and The Café, a stylish, European-style, glass-fronted spot overlooking Regent Street, is great for light lunch and dinner and watching the world walk by. Absinthe at the (appropriately named) Green Room. 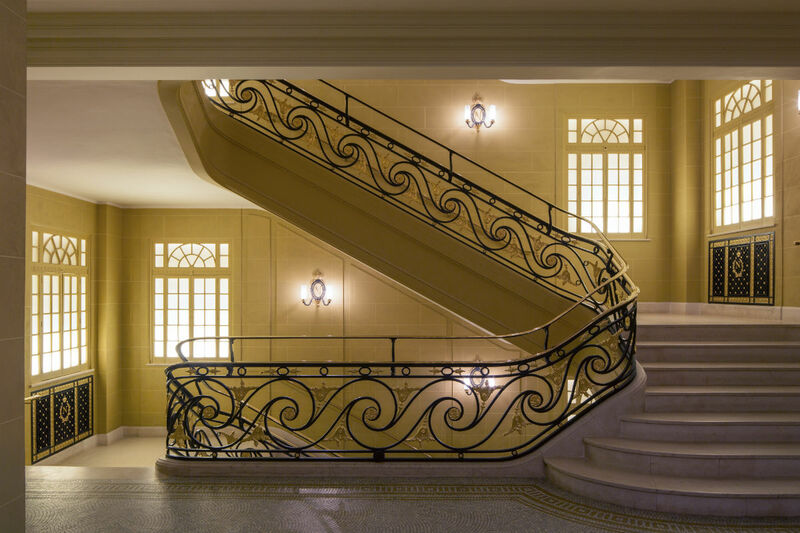 Follow the stairs to the private Member's Club. My in-room breakfast was a feast of scrambled eggs, fruits, juices, and teas served on an elegantly laid table with a copy of The New York Times, which I hadn't seen in print since leaving Los Angeles two years ago. One evening, dinner started with alcohol-free cocktails in the fabulous and stylish Green Room and continued with a light dinner of delicious smoked salmon, gluten-free bread, and salad in The Café. Food is also served in the private Member's Club on the first floor (get there via the winding marble stairs), Oscar Wilde Bar (alongside excellent cream tea), and in the spacious Ten Room downstairs. 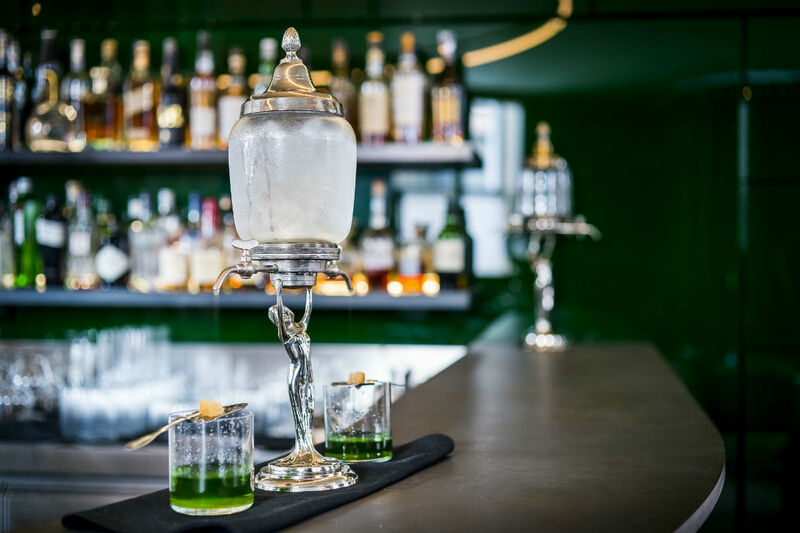 Historically one of the most famous restaurants in London, Ten is currently encouraging guests to bring in their own ingredients for chefs to cook. The hotel will have top Spanish chef Alberta Adria in residence for 50 days starting in February as part of its lineup of cultural and culinary events. The rooftop terrace of the Dome Penthouse. 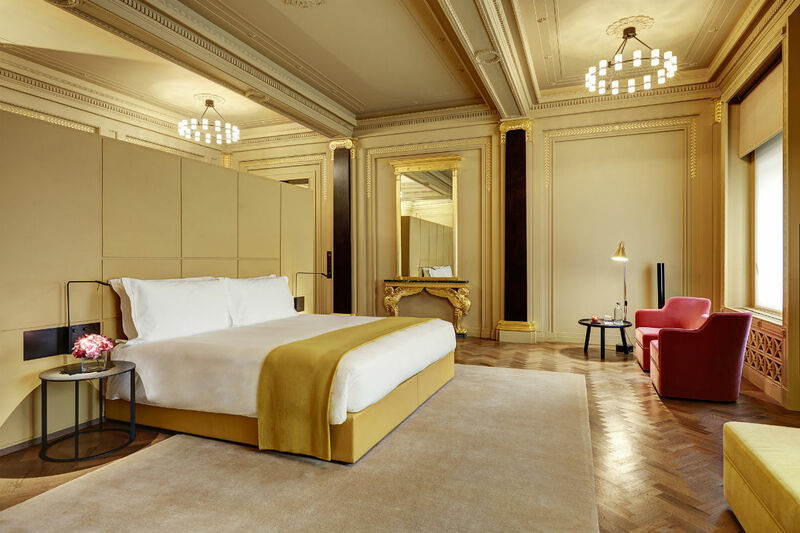 Designed by architect David Chipperfield, the hotel has 160 gorgeous rooms situated off sleek hallways. 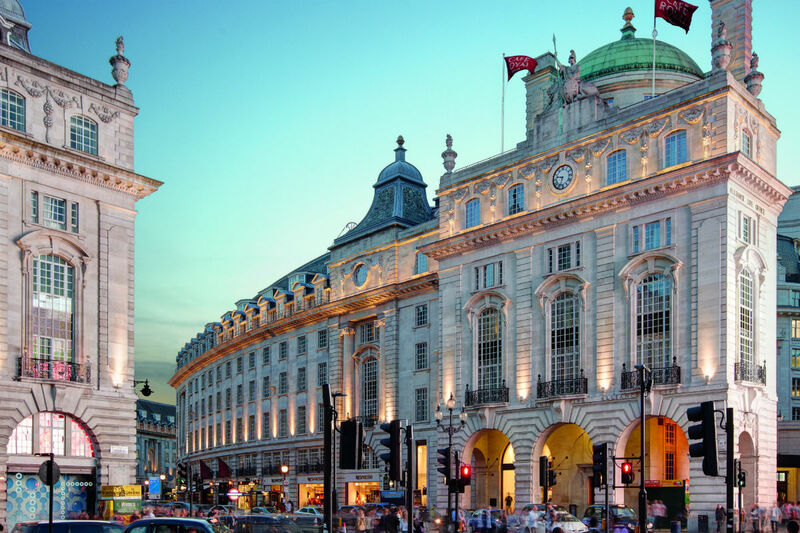 Many have amazing views over bustling Piccadilly Circus and Regent Street and include all sorts of luxuries like toiletries from Floris, Britain's oldest perfume house, and complimentary Nespresso. Five signature suites with names like Royal Wing and Presidential Suite come with private butlers and all sorts of extras like luxury guest bedrooms. The three-bedroom Dome Penthouse is in a listed part of the building and is another highlight. 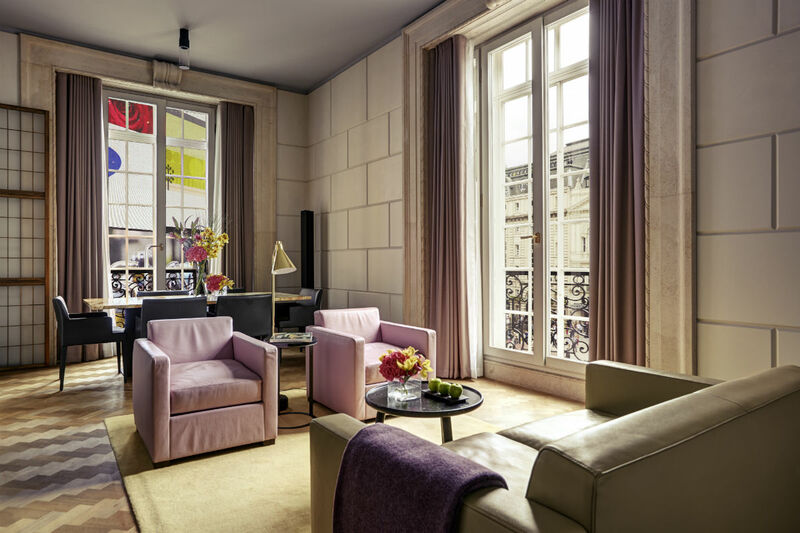 My room was generously sized, with a sophisticated combined living room and bedroom that was larger than most of the apartments I have lived in. It had a beautiful sitting area, a large entrance hall, and the most amazing view over central London. The bathroom had a vast bath and a television behind the mirror. Anyone who likes fabulous design and history and wants to stay in a cultural and culinary hotspot in the heart of the British capital. I could live here. Those who don't want to splurge and don't appreciate the finer things in life, like feeling history from a place simply by stepping inside the door. Hotel Café Royal is situated near Piccadilly Circus, the beating heart of London. Here, throngs of tourists wander towards Covent Garden and nearby Buckingham Palace and up to the many shops on Regent and Oxford Street. This is as lively as London gets. Visitors are spoiled for choice. Nearby stores include Selfridges and legendary toy store Hamleys. The fabled outdoor market in Covent Garden is always good for live entertainment. For food, there's roast duck at yummy Chinatown locales like Hung's (27 Wardour Street; +44-20-7287-6580), new eateries in the famous theater district like Opera Tavern, and grand Parisian brasserie fare at Brasserie Zédel. There are many destinations for art lovers: Royal Academy of Arts, contemporary galleries like Blain: Southern, and Marian Goodman Gallery, the art doyenne of New York's new London spot in an awesomely renovated building on Golden Square. After hours, one cannot miss Milroy's, the oldest whisky shop in London. It has been taken over by a young mover and shaker who has added a hipster cocktail bar. And down side streets in Soho are racy alternative club nights like Boylexe for male burlesque. Rates start at £440. Click here for reservations.